Shotguns aren’t usually the first thing that comes to mind when thinking about deer hunting. 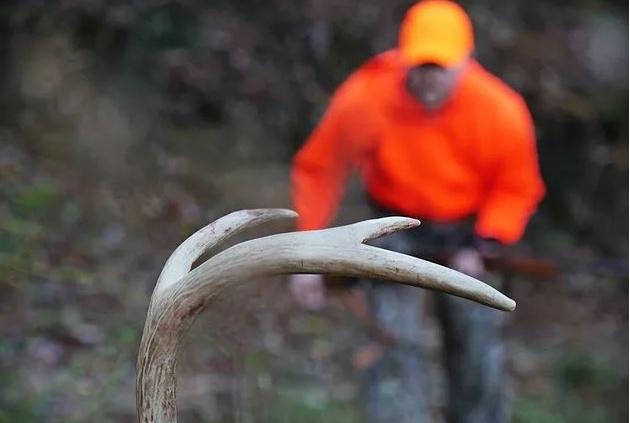 Centerfire rifles, archery equipment, and muzzleloaders are popular in today’s deer hunting culture, but there is no doubt that slug guns have their place. Mount an optical scope on your deer shotgun and suddenly you find more confidence in the shot and in the hunt versus the standard beads it was outfitted with. There is a wide selection of slug gun and shotgun scopes on the market for deer hunters who are taking their shotgun to the deer woods and stand. Whether you hunt deer with a shotgun due to regulations, preference, or tradition; there is a scope that is the right fit for your slug gun. Some factors to consider when selecting the best shotgun scopes include: toughness, accuracy, budget, and innovation. Let’s take a look at some popular models and considerations for each. Slug guns were previously thought to not be accurate or efficient at harvesting game animals past 50 yards. However, new slug loads with proper practice can deliver accurate shots at and even past 100 yards. With these advances shotguns are perfectly suitable for taking deer out to 100 yards. That distance that is more than sufficient for most deer hunts, especially for those hunting in the east. Pursuing whitetails along hardwood bottoms, creeks, and farmsteads is an ideal fit for 12 and 20 gauge shotguns. The distance even covers most Midwest deer hunters. Modern slugs are more accurate than ever, and with some time behind the trigger you can master the deer slug gun. Mounting a quality scope with robust rings and bases that can handle the shotgun’s recoil provides slug hunters with accuracy, increased effective range, and peace of mind. Many states in the Midwest and East have low velocity only firearm seasons including shotguns and muzzleloaders. Some states that have recently allowed centerfire cartridges still have areas designated as shotgun only. 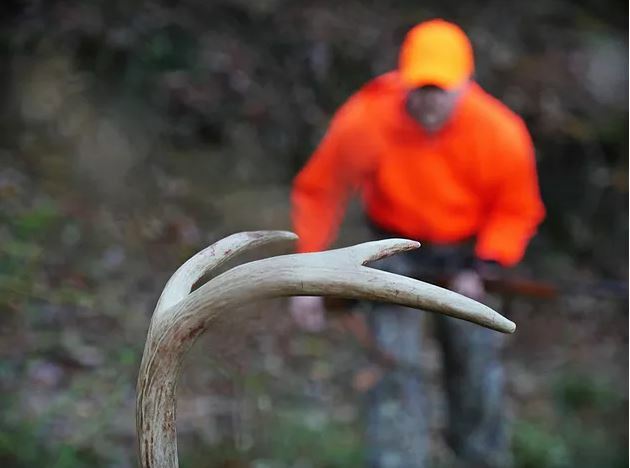 If you are interested in taking a giant Iowa bruiser, or an Illinois monarch whitetail with a firearm, you should consider setting up a shotgun for the hunt. States like Kansas, Wisconsin, and Minnesota that are known worldwide for the quality of their trophy deer have wildlife areas and units that are open only to shotguns and muzzleloaders during firearm season. Hunters who are versatile and open to multiple weapon choices and hunting styles will find additional opportunities when it comes to seasons and areas that are available for them to hunt with shotgun only firearm regulations. Both 12 gauge and 20 gauge shotguns are well suited to firing and hunting with slugs. Chances are the duck gun or upland shotgun you have at home will work just fine for hunting deer. A few modifications like choke selection, or adding a rifled barrel, and the addition of the right shotgun scope will improve your accuracy and your hunt. Optics manufacturers have not forgotten the shotgun hunter, and there are fantastic options when it comes to choosing a scope for your big game shotgun! Shotgun scopes must be rugged and built with quality components. One thing is for sure, shotguns produce plenty of kinetic energy, energy that translates to effectiveness when hunting, but also to felt recoil on the gun and shooter. Using a quality scope from a manufacturer who stands behind their product is a must when it comes to a deer hunting shotgun. 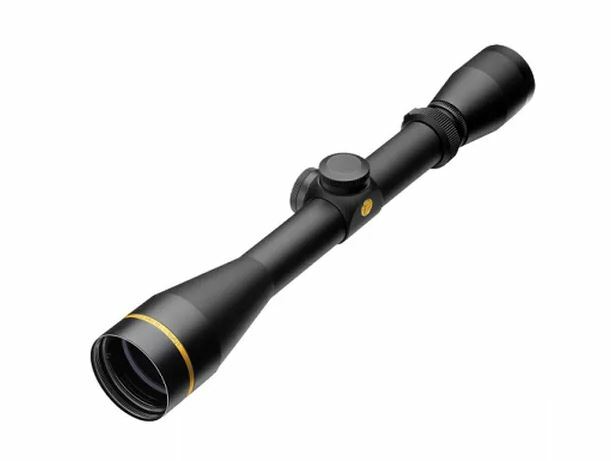 Leupold has a fantastic offering at an amazing price point with their Leupold Ultimate 3-9X40 SABR Shotgun Scope! Leupold has a famous lifetime guarantee on their optics line, and their SABR scope designed specifically for shotguns and muzzleloaders is no different. You can rest easy with confidence knowing that you’ve got a quality scope designed for shotgun hunting and shotgun recoil when you step into the deer woods with the Leupold SABR scope on your slug gun. Firing a 70 caliber projectile from a 12 gauge shotgun does not diminish the need for accuracy in hunting in any way. Shotgun hunters still work to squeak out every bit of accuracy they can get from their scope, gun, and ammunition system. There is no substitute for practice when it comes to accuracy, but the use of quality tools and proven methods both in practice and application lends itself to accuracy and success in the field. One development in tools when it comes to accuracy and ballistics is the Bullet Drop Compensator or BDC reticle in modern scopes. The BDC reticle system is a tool for shooters to use at varying ranges designated to a firearms specific ballistics. Built directly into the scope and reticle system. Nikon has a terrific offering at an incredible price point with the Nikon Prostaff Shotgun Hunter 2-7X32 BDC 200. Nikon incorporates their Nikon Spot On Ballistics Match Technology into the BDC reticle. This advancement takes the guesswork out of hold over and compensating for sabot or slug drop at varying ranges. With practice at the range, shooters can identify exactly where their loads are hitting at varying distances compared to the BDC reticle in the lens. Budget, price point, and return on investment are all considerations to account for when you are investing in the best shotgun scope for your situation. Making your budget work for you and finding great deals on quality gear is almost a hunt on its own. With dollars in mind, there are some great options for slug gun hunters searching for the right scope on their shotgun. 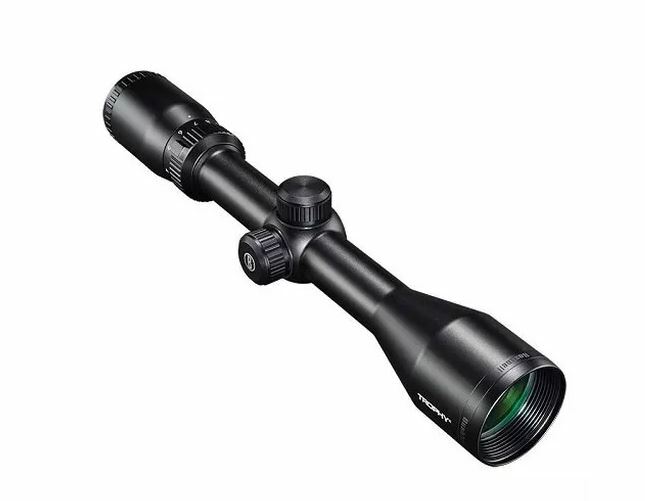 Take a look at this incredible value on a Bushnell Trophy 3-9X40 DOA 200 Shotgun Scope. 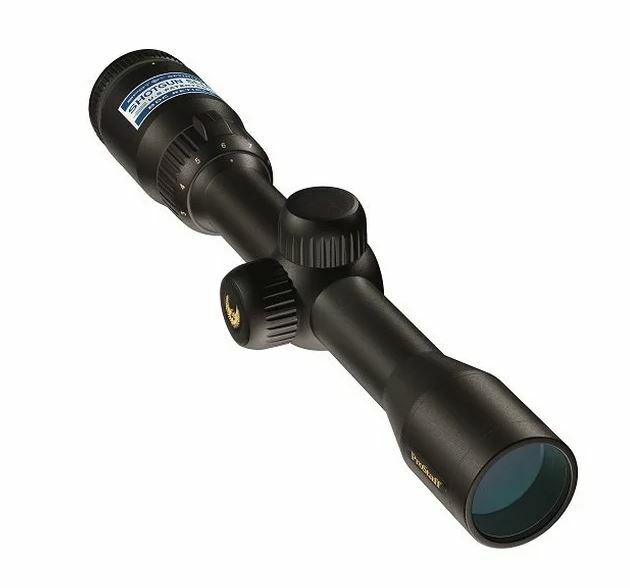 The Bushnell Trophy 3-9X40 DOA Shotgun Scope combines amazing features at an affordable price. 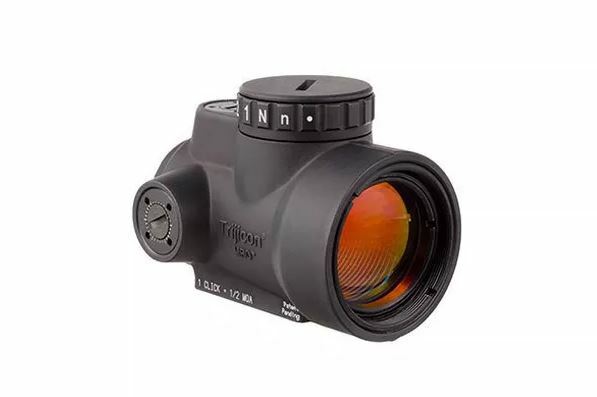 With unbeatable clarity and light transmission, Bushnell optics are a terrific option at a great price. With features like 100% waterproofed one-piece tube, and rigorous recoil testing it’s hard to go wrong on such a great deal. Occasionally, technology comes along that is a game changer, a disruptor in an established market. That is the case with red dot sights. While not a new idea or design by any means, red dots are gaining in popularity in the hunting community where tubular type scopes have ruled for decades. If you are considering putting an optical sight on your slug gun, be sure and consider the red dot option. Designed for fast target acquisition, small form factor, and the ease of shooting with both eyes open; red dot sights offer shooters a terrific alternative to traditional scopes. Trijicon is a leader in the red dot sector with many options to choose from. This Trijicon MRO 1X25 2MOA Red Dot Reflex sight is the perfect option for a deer shotgun red dot. Trijicon is known for their rugged and reliable product line making them a strong choice for shotgun optics. Designed with ambidextrous controls, multiple brightness levels, and 5+ years of battery life, it’s hard to beat the Trijicon MRO 1X25 2MOA Red Dot Reflex as an option for your deer hunting shotgun. Shotguns are a tool for deer hunters that should not be overlooked. Powerful and reliable, hunters have used shotguns in the deer woods for generations and their effectiveness cannot be discounted. Whatever reason you choose to pursue North American Whitetail with a shotgun, take careful consideration when it comes to the right optic for your slug gun. Multiple factors come into play and will help you decide which optic is right for you.